Sunday, Jan. 14, 4 p.m.—SO. POMFRET—Join ArtisTree for an evening of new works composed by Althea Sully Cole on her Kora, a 21-stringed West African harp, and performed on the kora she constructed herself in Senegal. The performance takes place Sunday, Jan. 14 at 4 p.m.
Althea Sully Cole is a multi-instrumentalist, vocalist, and ethnomusicologist from New York City. She received her B.A. in ethnomusicology at Barnard College, Columbia University in 2012 and her M.A. with distinction in music in development at the School of Oriental and African Studies, University of London in 2016. As a musician, Sully Cole has worked with Billy Harper, Billy Bang, Ras Moshe, Fred Ho, Sahad Sarr, Daara J Family, Faada Freddy, Royal Messenger and father Bill Cole (in his Untempered Ensemble), among others. In 2010, she was a weekly vocalist at the legendary St. Nick’s Pub. She has also worked as an accompanist for flamenco dance companies and studios on guitar. Sully Cole has studied kora under korists Yacouba Sissoko and Edou Manga and was a resident artist at Bois Sakre studios in Senegal from 2013-15. 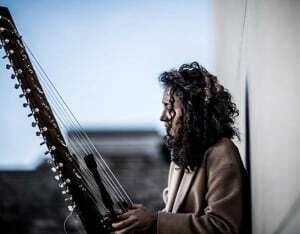 In 2015, she formed the duo 42 Strings alongside traditional Chinese zheng player, Muqi Li, with whom she performed at Royal Albert Hall and on BBC 3 Radio. As an ethnomusicologist, Sully Cole worked as an FCC licensed jazz programmer at WKCR; interned in the Public Programming department at Lincoln Center for the Performing Arts; worked as an archivist Association for Cultural Equity (home of the Alan Lomax Archives); hosts The Earfull, an audio podcast that explores the lives of musicians through music; performed research for the Musee de Thies; worked as a music specialist at the International School of Dakar; and was most recently the music programs editor at SOAS Radio. Tickets for the show are $10, and are general admission. Purchase them online at artistreevt.org. ArtisTree is located at 2095 Pomfret Rd., South Pomfret.